This year KayCee organised a Halloween party for her friends while Ella went Trick Or Treating with her friend and her friend’s older sister. By all accounts, they both really enjoyed the night and I’m here to share a few of the Halloween photos they took; they didn’t get many photos because I think everyone was having too much fun to remember to take them! KayCee’s Deathly Hallows pumpkin – she scooped out the middle and got it ready to carve but ran out of time so had to turn to her dad for help! Ella’s Harry Potter pumpkin – she also got help from dad! Here are a couple of our Pizza Pies. They all thought they were delicious and I reckon we’ll be making them again soon; especially seeing as I couldn’t try them because of my diet! For more fun Halloween food ideas, check out my Pinterest board. 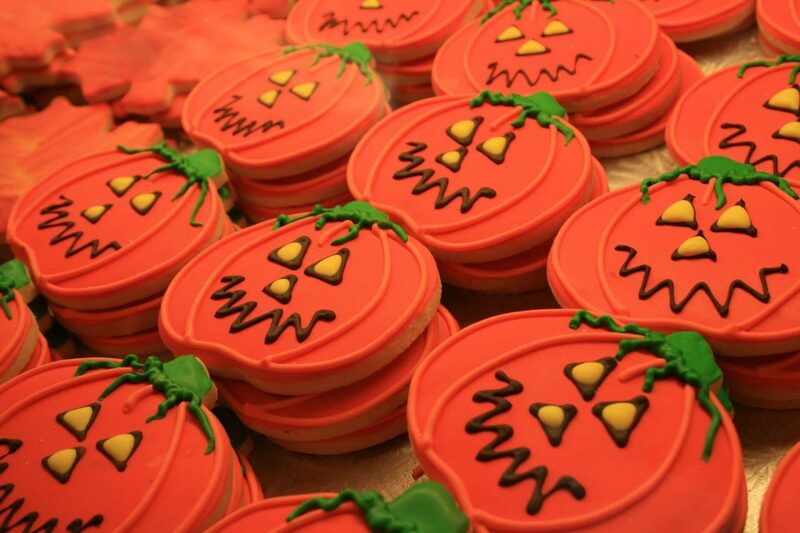 This is a basic sugar cookie recipe for Halloween cookies. We also make them using a gingerbread recipe which works equally as well. Preheat oven to 180° C. Grease and line two cookie sheets. In a bowl, cream together butter and sugar until light and fluffy. Beat in vanilla extract and egg. DO NOT CHILL THE DOUGH. Divide into workable batches, roll out onto a floured surface and cut into whatever shapes you desire. Bake for 8-10 minutes. Let cool on the cookie sheet until firm enough to transfer to a cooling rack. I’ve found a great video on YouTube that shows you how to flood fill cookies. We’ve never thrown a Halloween party before. I’d promised the girls that we would have one, one year and this was our Halloween 2017 party. I’m happy to say, they had a great time 🙂 They decorated the new covered outdoor kitchen and set out a buffet. They invited friends from school and they all arrived in brilliant costumes. After filling up on burgers and Mummy hotdogs followed by apple slices dipped in chocolate from the chocolate fountain, they all went Trick or Treating. I have to confess, though, that I’m a little annoyed with myself. I took photos of all the food and decorations but totally forgot to take photos of Kaycee and Ella in their costumes! Kaycee and Ella have a Halloween party planned and they’ve been searching for food and drink ideas. 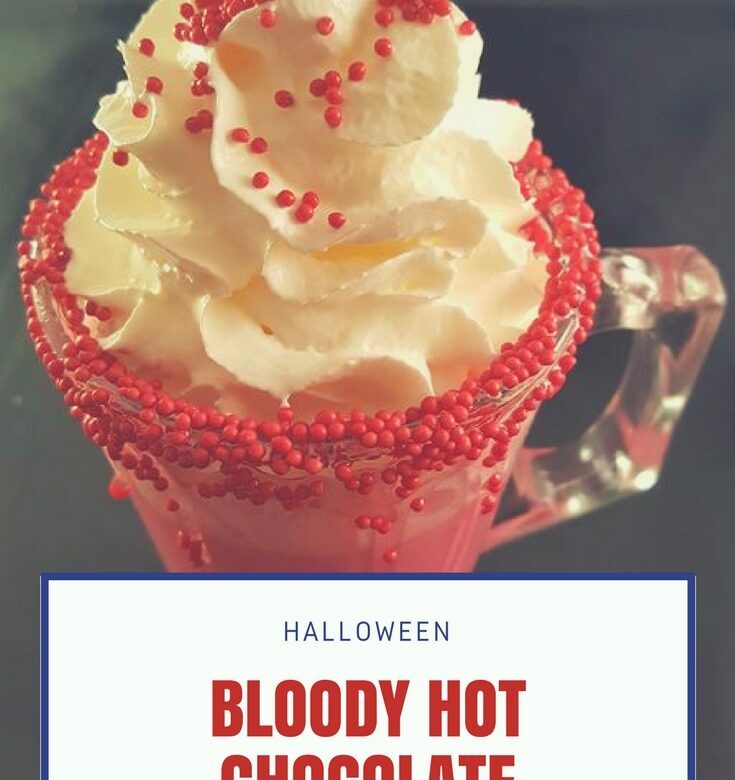 We tried this bloody hot chocolate recipe, (just to make sure it tasted ok before we serve it to the guests, obviously) and we all loved it! Last year Ella was very excited when we had to go to HomeSense to check out their Halloween products. Ghosts and Witches and Dracula and Skeletons! You can serve punch in his head! I’d keep this out all year, it’s so pretty! Taken by Ella. She thought this was quite funny!